Along with discussions ongoing throughout the year, it’s necessary to put out a survey to the teachers before even contemplating what technology purchases we wish for next year. This survey gives myself and the administration reflections on this year and recommendations from teachers for next year; what’s working and what needs to be looked at. Using Google Forms is a no-brainer due to it’s simple implementation and sharing amongst our staff via embedded form in an email. I would love if they could upgrade how text responses are summarized though. 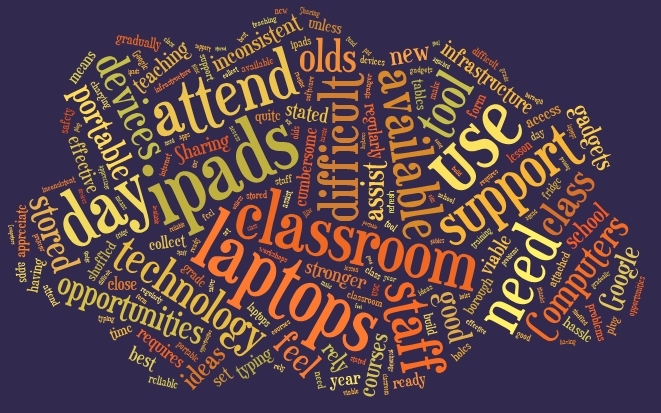 I used Tagxedo to make word clouds of the most commonly used words in the text responses. Here is what I got back this year to base our technology purchasing off of for next year. I know from this that one teacher didn’t fill in the survey! Duly noted! It’s hard to gauge walking around the school at one point on one day who is using the technology they have at their disposal and how frequently. I still get asked it though! I would hope that teachers are answering truthfully so I’m pretty happy with the responses. The once a week answer was followed up on as a high priority as it came as a surprise. 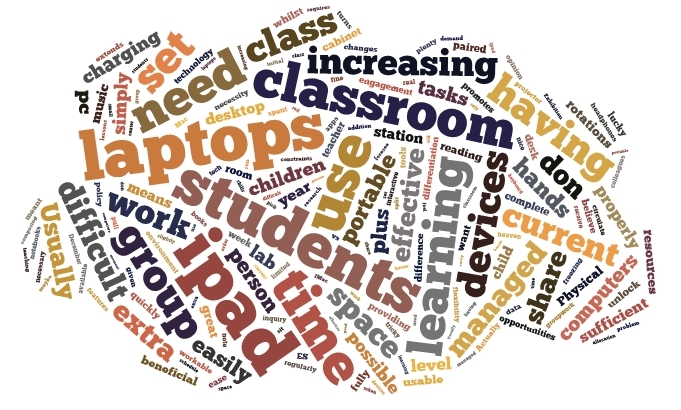 What do you use your devices for in class? I will add an Google Doc for the full answers below this illustrations. This shows, obviously as it should, a wide range of uses of the devices available. At the start of this ongoing school year was the first time ever that our elementary school was kitted out with a large number of new technology devices. 6 Macbook Pros per classrom (G3-5), 4 Macbook Pros per classroom in G2, 2 Macbook Pros per classroom in G1 (with 2 iPads) and 4 iPads per classroom in Pre-K and K. This was as a result of our survey last year and subsequent presentation I gave to the school board. These responses indicate that teachers now are seeing the advantage of having in-classroom devices and they want more! 1:1 would be awesome but it’s not going to happen straightaway! Hopefully our purchases next year will fill a few needs and wants. Please give your reasons for your answer above. This is regarding if the number of devices is enough in their classroom. 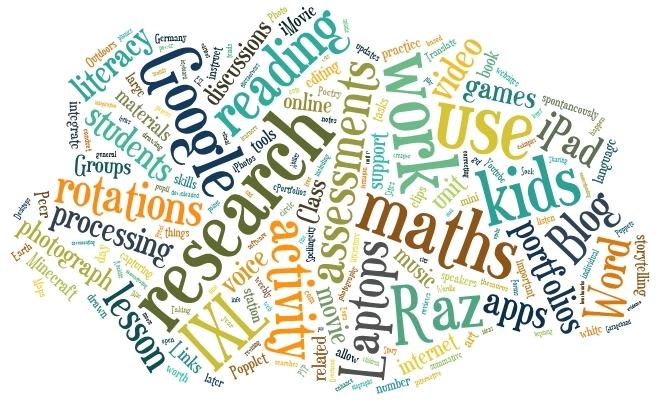 Not a lot to go by in the word cloud but looking through the full answers the main thread of thought is not enough devices available which leads to logistical problems. A lot of wishes for more devices. 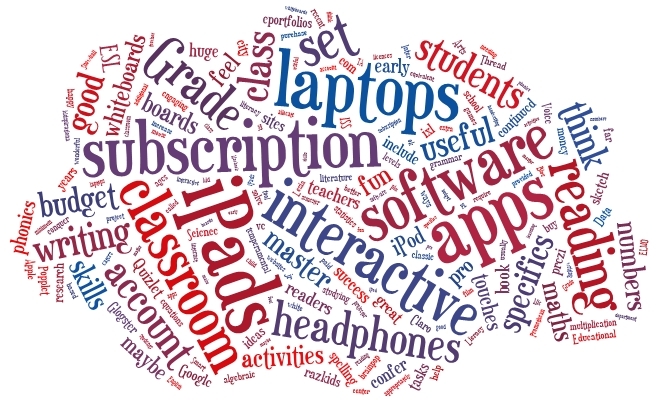 Please indicate what further purchases in technology could improve your classroom and assist in teaching and learning. More iPads and laptops! There have been an increased demand for iPads in the upper grades of ES which I never thought would happen due to the power of the Macbook Pros and the massive use of Google Drive (iPads don’t play too well with Google Drive). The demand is due to the number of apps which allow for student-directed instructional videos with apps like ShowMe and for apps which allow easy animation and storytelling projects. We also have a wide range of learning support and ESL which the iPad lends itself well to. If you feel you don’t use the devices as often as you should, state why here..I’m very happy to say that only 7 teachers filled this in but still it’s a very important answer to pay attention to as a school. Again the answers were mainly relating to logistical problems with not enough devices at hand when needed. After the survey results we are going through the purchasing process now and know that a session on the practicality (sharing when needed, charging, storing) of having classroom devices needs to be focused on.